Looking For An Adventure Holiday? To get upto Rs.1000/- off on Yatra.com. Located in the Beas Valley, towards the north of Kullu Valley, the scenic hill station of Manali was once the starting point of an ancient trade route to Ladakh, and onwards over the Karakoram Pass to Yarkand and Khotan (former stops on the Silk Road, now in China’s Xinjiang province). The town is packed with holiday-makers during season, and the villages around – including blissed out Old Manali – are a magnet for hippie tourists. Surrounded by dense pine forest, fruit groves and snow-covered mountains, Manali lies sandwiched between the magnificent Pir Panjal and Dhauladhar peaks. But besides the beautiful Alpine vistas of mountains and conifers, meadows and orchards, Manali – along with Kullu Valley, 44km away – also offers adventure options aplenty, including trekking, rafting, skiing, paragliding and mountain biking. The latter three activities can be enjoyed at, and around, the spectacular Rohtang Pass. For those with looking for a tranquil getaway, there’s also angling on the Beas. Manali features in the Mahabharata, and there’s much that’s sacred about the town and the neighbouring area. Home of gods and goddesses, it is also said to be the abode of Saptarishi, the Seven Sages of the Hindu faith. The town is thought to be named after Manu, creator of the human race on earth (after a flood had devastated the world), and law-giver of the Hindu faith. In old Manali village, there is a shrine dedicated to Manu (Manu Rishi Temple). When the British came, they introduced apple trees to the area. Apples – along with plums and pears – still make up much of the income of the local economy. During the phase of militancy in Kashmir, Manali became a popular summer getaway. 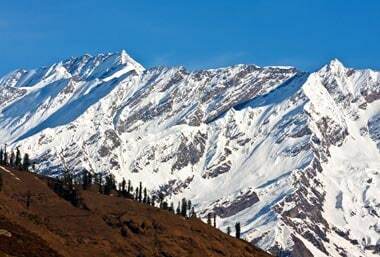 Manali lies amongst the Himalayan region’s highest mountain range, surrounded by mountain peaks. Despite that, it is surprisingly accessible by road. It is located at the head of Kullu Valley, next to the River Beas. 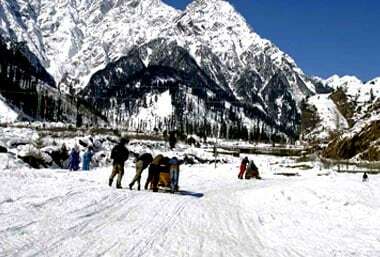 Manali has relatively cool summers and cold winters. In summer, the average temperature ranges between 10C to 25C, while during the winter the average is between -7C and 10C. There’s heavy snowfall in the months of December, January and (occasionally) February. Manali is connected to Chandigarh by NH21, which passes through the towns of Bilaspur, Sundernagar, Mandi and Kullu. The distance from Chandigarh is 292km, and from Shimla 253km. The nearest airport is at Bhuntar (10km from Kullu), which is connected to Delhi and Shimla. The nearest railheads are at Chandigarh, Kalka and Pathankot, from where Manali can be reached by road. By car, the journey from Delhi takes 9hr (approx. ), from Shimla 4hr and from Chandigarh 5hr. Manali is also well connected to Dehradun, Haridwar, Dharamsala and Chamba/Dalhousie, by road as well as by bus. There are regular Volvo (AC) buses from Delhi (16-17hrs), Chandigarh (10hrs), Shimla (8-9hrs) and Dharamsala (10hrs). Buses head to Kullu every 30min (1hr 30min) and continue on to Mandi (4hrs) passing through the airport at Bhuntar (2hrs). There are also frequent local services to Naggar (1hr); if heading to Parvati Valley, change at Bhuntar. The state HPTDC runs services to the Rohtang Pass (7hrs), and Manikaran in the Parvati Valley (9hrs 30min). River rafting in India offers you an excursion through a series of adrenaline-rushing rapids down the fast streams. Know more about the most popular adventure tours in India. Know more about the most popular wildlife tours in India. Paragliding in India can be enjoyed at various hill stations dotted across the country. Know more about the most popular skiing destinations in India. Explore Bungee Jumping options in India. © 2013 Adventure & Nature Network Pvt. Ltd.
We use this address to send you notifications and booking related information. Accessible Adventures Adventure Running Aerosport Angling Birding Bungee Jumping Camel Safari Camping Canyoning Caving Cycling Hiking Horse Safari Hot Air Ballooning Jeep Safari Kayaking Mountaineering Off Roading Outdoor Photography Paragliding River Cruising River Rafting Rock Climbing Sailing Scuba Diving Self Drive Skiing Sky Diving Trekking Wildlife Safari Wind Surfing Zip Line Activities you want to get aligned to. I pledge to become an active member of this community, whether it is to share my knowledge or experience or to help others to safely and responsibly participate in adventure- and nature-related activities. Further, as a responsible contributor, I will endeavour to use my practical skills and experience to educate future generations so that they may become caretakers of our water, air, land and wildlife. I will follow only those practices that help safeguard the environment, and those that benefit local communities. I will also undertake not to engage with fellow tribe members - or others online - in any interaction that may be deemed as vulgar, profane or harmful. In addition, I affirm that I am above 18 years of age.